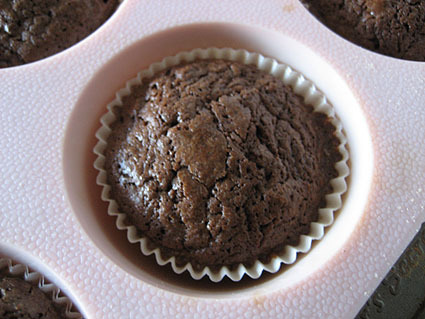 To cure my craving for chocolate, I made cupcakes using my favourite brownie recipe today. The recipe is from Donna Hay Modern Classics, Book 2. Take a look inside the book here. Most recipes I’ve made from the book have been succesful with after adjustments. The brownie recipe is always a winner. I usually bake it for 40-45 minutes, instead of the suggested 50 minutes, in a shallow slice tin. Watch the brownies carefully as they cook! If you overcook them, the fudginess will disappear. I have found the best results with the mixture come from using the cheapest dark cooking chocolate I know of – Black and Gold. I’m sure that goes against every rule in the book but it works! I plan to experiment some more with chocolate brands. I’m not yet convinced that brand names are better quality (taste, texture etc) for every cooking ingredient. 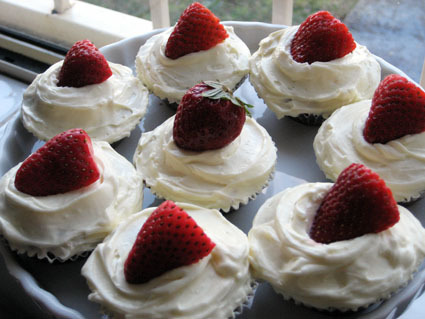 This is the first time I have made them as cupcakes. The mixture made roughly 24 smallish cakes in about 25 minutes at 160 degrees C. I filled the cupcake tray to at least 3/4 full as the brownie mixture does not rise as much as a cake does. 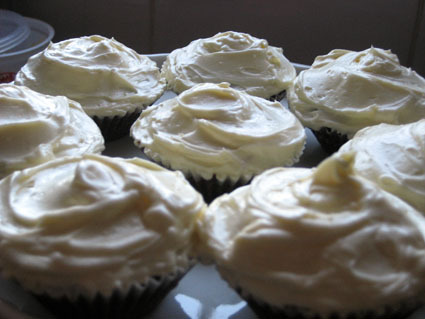 To please the recipients, I topped them off with cream cheese frosting. Cream cheese isn’t my cup of tea, so I left some plain. The frosting mixture generously iced about 12-15 of the cupcakes. Preheat the oven to 160 degrees Celsuis/320 degrees Farenheit. Place the chocolate and butter in a saucepan over low heat and stir until smooth. Allow to cool slightly. 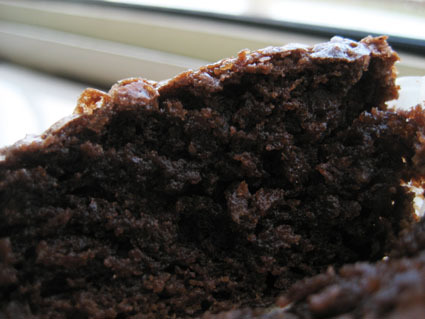 Place the sugar, eggs, cocoa, flour and baking powder in a bowl. Add the chocolate mixture and mix until combined. Pour the mixture into a 20 cm/8 in square slice tin lined with non-stick baking paper. Bake for 50 minutes or until set. (I bake it for about 40 minutes, or until a cake tester/skewer comes out slightly wet) Cool slightly in tin. Cut into slices. Serve warm or cold.